I love clothing. Choosing what to wear is my creative outlet. But I also have dedicated my life to fighting injustices, working on building a more just economy and, ultimately, trying to make the world a more fair place to work and live. I love to shop, but shopping is also a source of inner conflict, as I think about the people I don't see behind the clothing that I want before I buy. The apparel supply chain is extremely complex, starting with the raw material (cotton or wool are the most common agricultural sources) and going through 5-6 more processes to get a wearable product. Because the apparel sector is so labor intensive, and because globalization is here to stay, we have seen U.S. apparel production drop by approximately 92% since the 1960's. That means that in the 1960's the U.S. was making 95% of its clothing and today it is down to a mere 3%. The U.S. outsources 97% of its clothing production to countries around the world where labor is cheap and worker protections are minimal or non-existent, creating a race to the bottom for workers around the world. April 24 marks the anniversary of the worst ever industrial accident to hit the garment industry. Let us remember and never forget the 2013 disaster that struck the Rana Plaza factory in Bangladesh, which killed 1,134 workers. These workers were in that factory because, like most of us, they need to work to earn enough money to feed their families. 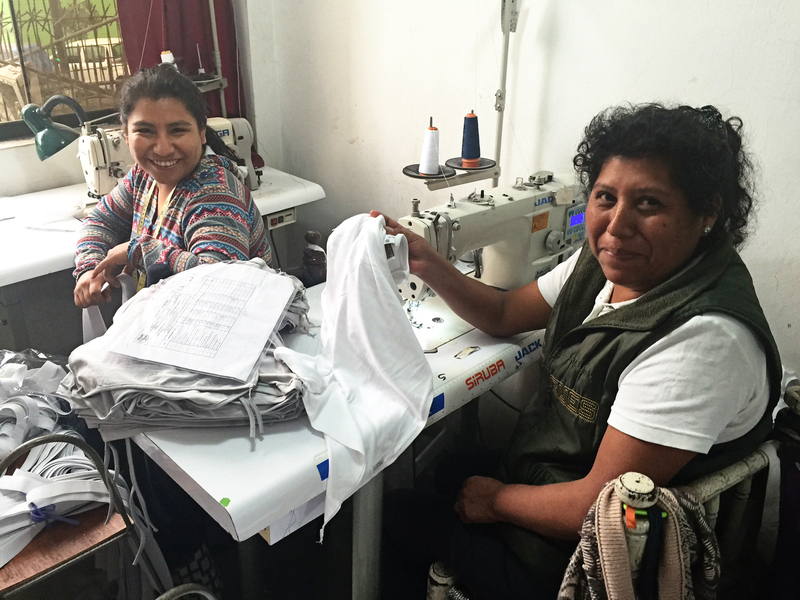 The reality - they were making clothing for consumers in wealthier countries like the United States. 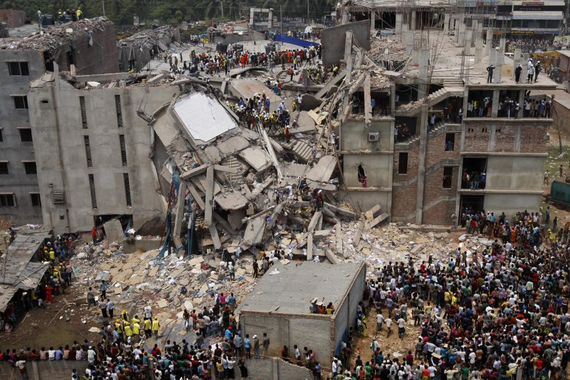 The Rana Plaza factory did not collapse due to a natural disaster. It collapsed because of structural failure, poor upkeep of the building and weak emergency plans and equipment. Photo Credit: rijans via Flickr under Creative Commons License. The International Labour Organization (ILO) set up a fund for compensation for the families called the Donor Trust Fund. The Clean Clothes Campaign put together a list of the brands that were linked to the factory and that have sourcing relationships in Bangladesh and called on them to help support the survivors and compensate families of victims. It took two years of heavy campaigning to encourage reluctant brands like Benetton to contribute enough to reach the funding goal. The Rana Plaza factory did not collapse due to a natural disaster. It collapsed because of structural failure, poor upkeep of the building and weak emergency plans and equipment. It collapsed with people inside because workers were told to work despite visible cracks in the walls. All of this is the result of the push for Fast Fashion. What is Fast Fashion? It is the speed of fashion trends rolling out and the scurry of consumers to buy more and more clothes to keep up with those trends; for the system to be maintained, these mountains of soon-to-be-outdated clothes need to be sold for less than the true cost of production. Those brands linked to the Rana Plaza disaster have a responsibility but those brands are not the only actors supporting this system of Fast Fashion. Keeping up with trends has become more important today than ever before. Where we used to have two clothing seasons a year, we now have a new clothing season with new styles available weekly. 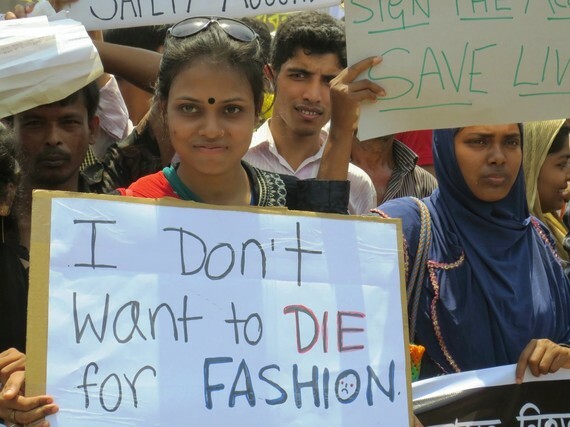 The culture of Fast Fashion comes at a high cost to apparel workers and the environment, and the system is re-enforced by government policy and international agreements. New trade policies such as the Trans-Pacific Partnership (TPP) are a risk to workers everywhere. The agreement will make it easier to shift production to the countries with lowest wages and weakest worker protections, taking decent manufacturing jobs out of some countries, and further trapping the most vulnerable workers in other countries in this system. And these international policies are virtually impossible to overturn once they are written into law. Rana Plaza was the largest and most publicized apparel disaster, but unfortunately not the only one. Victims and their families of these disasters must be compensated. But what about the invisible victims who make our clothing every day, in dangerous conditions, with little protection, and for poverty wages? We can stand together to say no more exploitation and start participating in transforming policies that affect workers around the world. We can be more intentional in the way we spend our money and think about clothing. There are many things we all can do immediately to demand Fair Fashion, rather than supporting Fast Fashion. The first thing to do is become more educated about the issue. Watch The True Cost, a documentary by Andrew Morgan and read my interview with him, and then pledge to be more intentional when purchasing clothing. You can show how you are doing this by signing onto our Demand Fair Fashion, Not Fast Fashion campaign pledge. You can also look for apparel brands that are creating alternatives and stay away from the big chain stores like H&M, Forever 21 and the Gap that are creating Fast Fashion. And as we direct more of our own purchasing dollars elsewhere, we cannot ignore the influence of these larger Fast Fashion corporations. We need to demand better from all corporations. Fashion Revolution is leading the call for consumers to think about fashion differently so that we can transform the industry into one that is more transparent and values the people who work in it, starting with asking the question Who Made My Clothes (#whomademyclothes). Even brands that are known for excellent social justice policies, such as Patagonia, are seeing injustices in their complex supply chains: http://www.theatlantic.com/business/archive/2015/06/patagonia-labor-clothing-factory-exploitation/394658/. But the good news is that they are looking and finding the problems so they can fix them because we cannot fix what we cannot, or choose not to, see. Brands like Patagonia should be applauded for this level of commitment and transparency and, following the call of Fashion Revolution, we should expect transparency and transformation throughout the entire industry. I will always love to shop, and I will continue to express my creativity through my clothing, while pledging to be intentional in how I spend my money so that I don't ever forget the people that make my clothing. Let's all take part in the fashion revolution and stand together so that workers and artisans are treated and paid fairly everywhere.